Some love, some like and a dash of dissent. 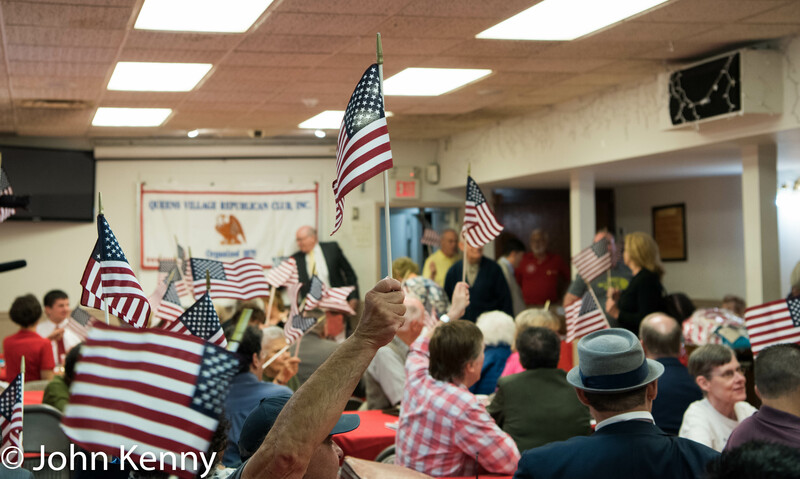 That was mayoral candidate Nicole Malliotakis’ welcome as she visited the Queens Village Republican Club Thursday night. She’s broadly popular with the membership and many expressly support her, but her support wasn’t universal. 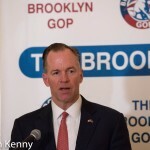 The New York City Republican Party has had “the right message but for years we have not had a messenger who could deliver it to allll the communities. 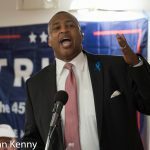 I’m telling you, right now, I am that messenger.” That was at the core of Republican mayoral candidate Michel Faulkner’s pitch to the Queens Village Republican Club in a recent visit. Faulkner’s fiery speech drew a standing ovation, far exceeding rival Paul Massey’s reception the prior month, although enthusiasm waned as he dealt with audience questions. 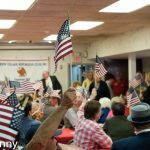 The Republican mayoral primary rolled through Queens Village Sunday as America’s oldest Republican club held its annual Lincoln Day Dinner. 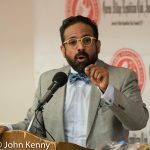 Over 300 people attended, lamenting the perceived faults of the de Blasio administration and hoping for a path to ending that administration. Candidate Michel Faulkner and prospective candidate John Catsimatidis spoke during the dinner, while candidate Paul Massey attended the cocktail hour but did not address the crowd, departing before the dinner began. 2014 Republican gubernatorial nominee Rob Astorino also attended the cocktail hour, but departed without addressing the crowd. With a long list of speakers and honorees, the dinner program limited the mayoral candidates to about 5 minutes each. 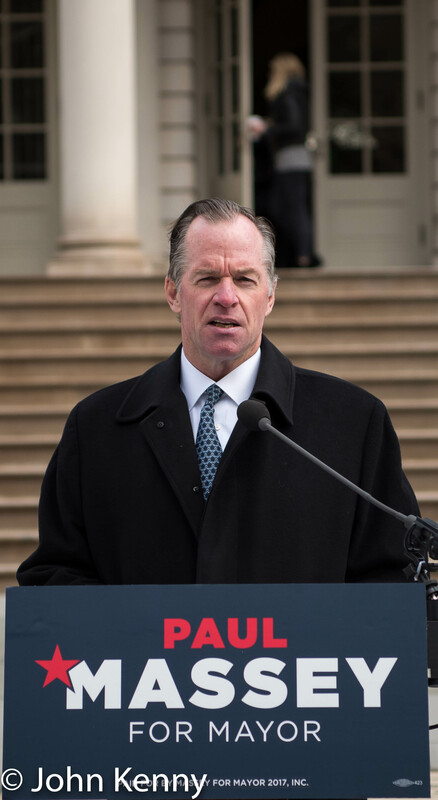 Faulkner took full advantage of his short time, launching into a fiery denunciation of Mayor de Blasio with a “dump de Blasio chant” and a declaration of “desperate times” in both the country and the city. 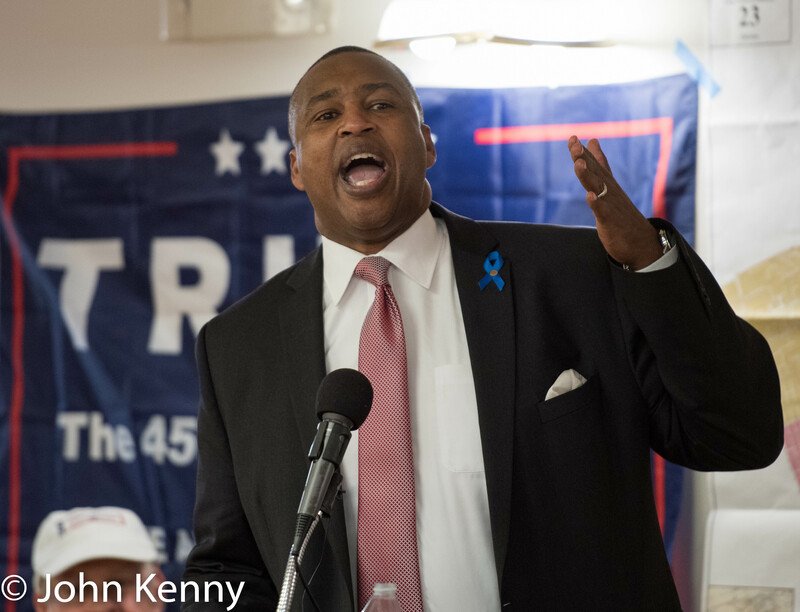 He breezed past his campaign finance difficulties, proclaiming that he’s “in it to win it.” He closed by quoting Donald Trump; unlike Paul Massey and prospective candidate Eric Ulrich, Faulkner is an enthusiastic Trump supporter. 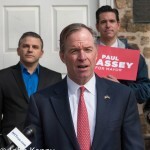 Republican mayoral candidate Paul Massey is having a tough time connecting with the Republican party faithful, despite some strengths as a candidate and support among the party leadership. 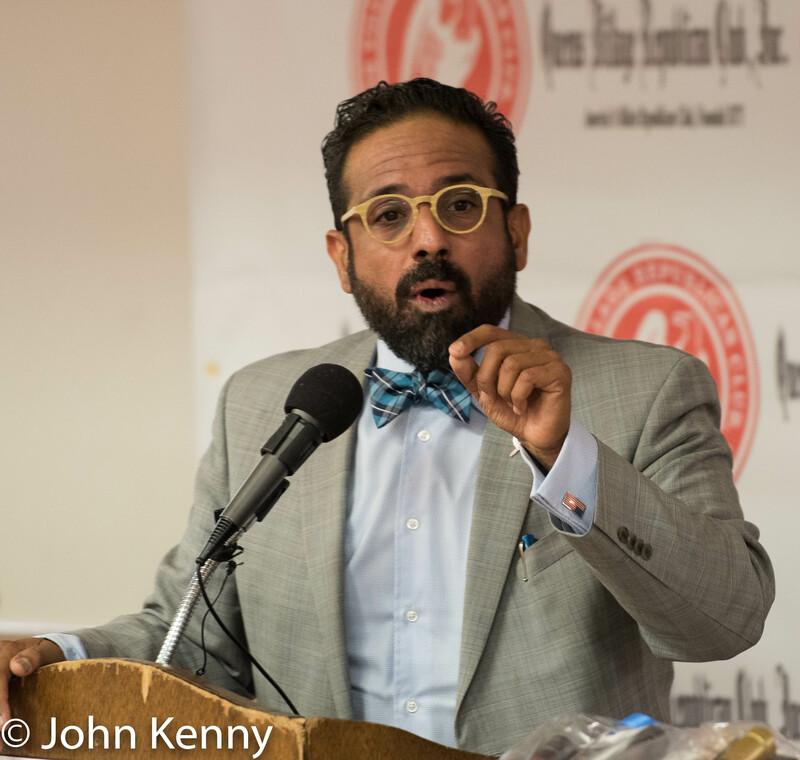 While “masses” may overstate the 60,000 or so Republicans scattered across the city who may actually vote on primary day it’s still a sizable group that Massey will need to persuade. 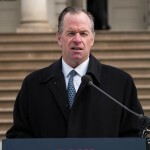 There are immediately apparent similarities between Massey and Michael Bloomberg: each is a wealthy self-made man who created and ran his own business, was born and raised in the Boston area, oozes self-confidence and discipline and chose New York City mayor as his first political race. 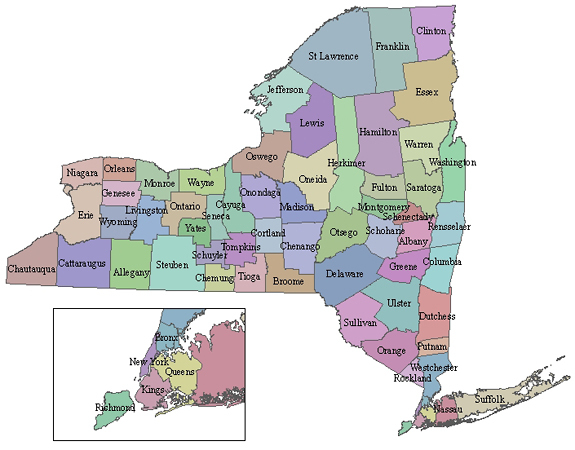 Resembling a successful well-regarded past mayor is a good starting point for a new candidate. 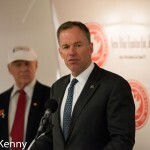 The downside for Massey is that Bloomberg, while now ever-more highly regarded as Republicans chafe under a de Blasio administration, was never really loved by the Republican rank and file and his Bloombergesque profile, at this early stage, appears to leave many Republican Party faithful cold. The operatic Rudy Giuliani, rather than the emotionless Michael Bloomberg, is the mayor these Republicans love. Massey may be a more personable and warm version of Bloomberg, but he’s nonetheless much more Bloomberg than Giuliani.